This compact speaker has impressive engineering and plenty of heritage behind it. Andrew Everard takes a listenSo, Scansonic – does the name seem vaguely familiar? Its MB series of speakers, starting with the MB-1 we have here and going all the way up to the MB-3.5 floorstanders, may be new (and just one of three complete speaker ranges on its books), but the brand name has an illustrious history, being deeply rooted in Danish speaker design and engineering. Scansonic goes back 45 years, when it was introduced as the name on a then-new line of loudspeakers from famous Danish drive-unit manufacturer ScanSpeak. Dantax after a period of being owned by Ortofon parent company Fonofilm, during which its co-founders pulled out and eventually found Dynaudio. You may be getting the idea by now that the inner workings of the Danish speaker/driver industry are both fascinating and entirely convoluted! For the design of the MB speaker series, Scansonic looked within its parent company to Michael Børresen, executive R&D manager at Raidho, where he has worked for more than a dozen years. And while there’s a clear influence from his work with Raidho designs in some aspects of the design here, the intention was always to make a range true to the Scansonic brand. Oh, and to Mark Børresen’s contribution to the design, his initials are on every model – hence the ‘MB’. 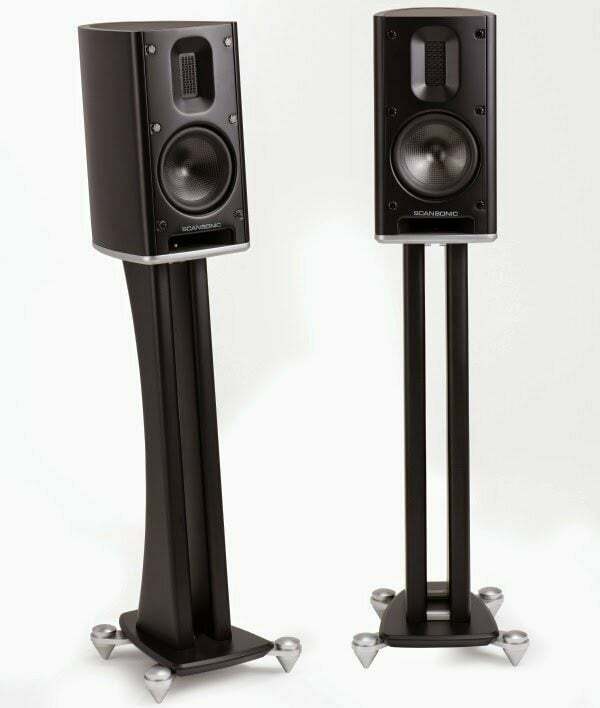 Available in black or white ‘silk’ finish, the speakers have a curved wall enclosure design, ported to the front, and can be used on a choice of two Scansonic speaker stands: there’s a curvaceous single-pillar model. Standing just over 33 cm tall, the MB-1 has pretty conventional ‘bookshelf speaker’ dimensions, but an all-up fighting weight of 6.1kg reveals the use of heavy bracing inside to further increase the structural integrity of what is already a rigid cabinet, thanks to those curved panels. Ribbon tweeters and carbon-fibre cones are found across the range, and the one in the MB-1 uses a Kapton/aluminium sandwich construction 0.02mm thick, meaning it weighs a fraction of a conventional dome diaphragm, making it easier to drive with less coloration. The 115mm mid/bass unit uses that carbon-fibre weave to obtain stiffness without weight penalties, and is of a dust cap-less design, driven by an overhung magnet system with a long excursion for powerful bass. Inlays line the slot-shaped port below the woofer to reduce noise, and the handover between the drivers centres around 3.5kHz. On the end of my Naim network music player/amplifier system, the immediate impression is of the scale and quality of bass: yes, the spec suggests they run out of steam at around 50 Hz, but when it comes to small speakers and low-end welly, there’s no sense of the sound lacking substance. Playing rock or pop music there’s weight and speed down there, ensuring rhythm sections power along smartly, and bass and drums have excellent character and drive. Scansonic doesn’t quote a sensitivity figure, saying only that nominal impedance is greater than 6 ohm, and that it recommends high-quality amplifiers of greater than 50W. That said, the speakers seem to be a pretty easy drive: as well as using my Supernait 2, I also try them with Denon’s PMA-50, and there’s never any sense the Denon is struggling, although the sound does take on further conviction and presence with the Naim. That bass weight may be the first surprise in the MB-1’s presentation, but what’s even more pleasing is the way the whole sound hangs together, with no sense of this being a one-trick speaker, and a generous, detailed overall balance that’s well beyond expectations of a design so compact. In particular the tweeter works exceptionally well, with an open, airy sound when playing atmospheric live recordings, excellent sting with cymbals without any sense of overcooking things with excessive splash or sizzle, and fine midband fluidity and detailing. Play some classic Miles Davis and it’s hard not to be drawn into the performance. There’s superb rasp and breath to the trumpet, while other instruments are handled in similarly convincing style, the bass has just the right amount of snap of finger on string then vibrational resonance, enabling the contribution of the instrument’s body to be heard. At the same time the drums have good punch and drive, while all the delicacy required to enjoy the times when sticks give way to brushes and the snap and fizz of the cymbals. While the bass is impressive for speakers of this size, there are times when its lower limits are apparent, for which reason I wouldn’t suggest these are the optimum choice for fans of church organ music or those enjoying room-shaking synthesised bass – that’s prog fans perhaps disappointed on two fronts, then! However, in general terms the MB-1 covers its tracks extremely well, and you’re more likely to be struck by how low these speakers can appear to go, along with the speed and tunefulness of the bass they deliver, rather than worrying too much about that last bit of low-frequency information that’s missing. There’s never any sense of a lack of weight, and by the standards of speakers of this size they’re extremely impressive. What is beyond reproach is the superb sense of soundstage depth, width and focus the MB-1s present: listen to a live concert through them and you get a sonic picture extending between and beyond the speakers, and in which performers are placed solidly and reliably. With a shade of toe-in toward the listening position, that remarkable focus is sharpened, and at the same time the feeling of front-to-back depth is enhanced; impressive, too, is the way they maintain that sense of solidity – which after all is what stereo is all about – even when you move off-axis. These aren’t ‘sweet spot’ speakers, limited to delivering their best at one, very narrow, listening position, and there’s no sense of the tweeters ‘beaming’: instead they’ve very clearly been designed for real-world listening, to be enjoyed by several people in the room at once, and they’re all the better for that. As well as the tweeter design, that has much to do with the way the two drivers and the crossover marry up to present music as a whole, with no sense of ‘handover’ between the drivers to catch the attention and divert it from the music. If you’re looking for rather superior speakers for use in a small or medium-sized room, and can afford both the speaker/stands package, all-in and the kind of amplifier you’ll need to hear them at their best, this is a highly competitive design. By combining room friendliness – that front-venting port means that you can use them close to a rear wall – stylish looks and a very persuasive sound seemingly beyond its modest dimensions, Scansonic has come up with loudspeaker well worthy of a serious audition.